A GROUNDBREAKING plan to see the Westpac Little Ripper Lifesaver drone technology deliver blood and medical supplies is being developed in Norwest. The unmanned drone program, the brainchild of developers Mulpha Norwest and The Ripper Group, is being explored following the success of the Westpac Little Ripper shark spotting technology. The drone would provide emergency first aid response — including the delivery of emergency medical supplies such as defibrillators, blood and antivenene — to first aid personnel. It could also be used to monitor traffic and security and manage crowd control during major events. 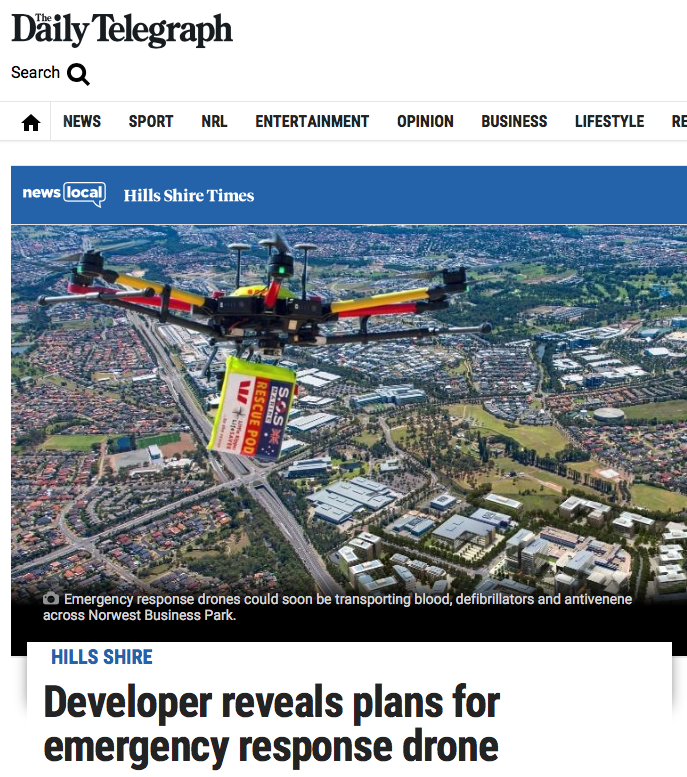 Mulpha development general manager Tim Spencer told the Hills Shire Times the program was a step towards a “smart city” reality for Norwest. “The technology is already here, so it is a matter of understanding it and planning for it in a strategic way, so that all issues are considered, proper testing and pilot programs are conducted and its method of development has the support of the community,” Mr Spencer said. Mr Spencer revealed testing was already underway, but he encouraged residents and businesses within the precinct to get involved in the planning program. “The smarts of the technology does not mean anything if the drone cannot help a community improve liveability,” he said. The Ripper Group director Harold Weldon said the technology abided by Australian Civil Aviation Authority (CASA) regulations. “The key of our humanitarian work, especially with our work with the Westpac Little Ripper Lifesaver drone saving lives … is to enhance public trust and to build a sense of safety and community,” he said. Mr Weldon said the company would continue to work with the University of Technology, Sydney to develop localised systems, while training emergency response units to interact with drones. “The crowd control potential of drones can probably be most easily expressed as a movable eye in the sky that can provide the emergency services live insights into potential overcrowding scenarios, boundary patrol or control,” he said. The drones will be on display as part of Mulpha’s Norwest Smart City festival at Bella Vista Farm Park on Sunday September 23, from 12pm to 9pm.